Rev. Fr. Francis Clair Graff, M.Ed., 88 of Blairsville, PA (Blacklick Twp.) 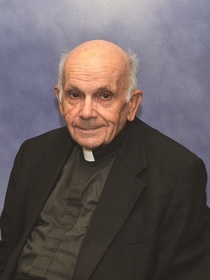 died on Friday, October 12, 2018 at Indiana Regional Medical Center, Indiana, PA. He was born May 7, 1930 in Black Lick, PA. He attended elementary school at Mahan, Blacklick Twp. and then attended Blairsville High School. He was a US Army Veteran. He went on to college and earned a Bachelor of Arts, Bachelor of Sacred Theology and a Masters in Education. Francis was ordained a priest on May 1, 1965 by Bishop John Wright at Saint Paul Cathedral, Pittsburgh, PA. During his career he was assigned to many parishes including, St. Charles Parish, Donora, PA; St. Dominic Parish, Donora, PA; St. Peter Parish, Pittsburgh, PA; St. Mary Help of Christians Parish, McKees Rocks, PA; St. Peter Parish, Butler, PA; St. Anthony Parish, Bessemer, PA and St. Camillus Parish, New Castle, PA. After years of service, he retired from the priesthood on June 1, 2009 and then went on to run a Christmas Tree farm in Grafton, PA. He was preceded in death by his mother, Marie Graff and his sister, Mary Rose Bolen. The family will receive friends at the James F. Ferguson Funeral Home, Inc., Blairsville, PA on Tuesday, October 16, 2018 from 2-4 & 6-8 PM. Mass of Christian Burial will be held on Wednesday, October 17, 2018 at 9AM in Our Lady of the Assumption Parish, Coral, PA with homilist, Fr. Joseph Beck and the most Reverend David A. Zubik as celebrant. Interment will be in the St. Francis Cemetery, Coral, PA.